Since I have virtually nothing to show from my outdoor garden, it’s back to the indoor plants to see what’s shaking. I brought my mandevilla in from the cold and it is doing great! In fact, these are all plants that I had outside for the summertime. This guy was in my son’s room, needless to say it went by the wayside, neglected and looking for love. I took it outside in early August and cut off every brown tattered leaf on it. It was pretty much a stub of a plant. Within a few weeks it started all these beautiful shiny leaves and was thriving once again. This spider plant lived all summer out on my front porch, I took it in a few weeks ago and it seems much happier inside than it was outside. Last but not least is my hibiscus that made me so thrilled when it bloomed all summer long planted in my garden. I put it in a pot, brought it inside when the weather got cold and it immediately turned brown and dropped every leaf. I was sure it was doomed. I cut off every branch and now it has sprouted all new leaves as you can see. So far so good with the plants I moved inside. 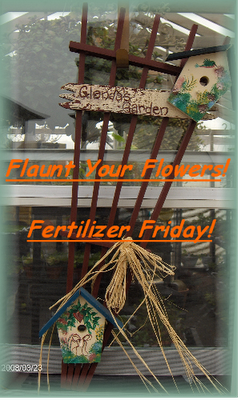 Visit Tootsie Time to see the other Fertilizer Friday posts. This flower pot is one of my favorites! I just love it. My neighbor threw it away. Yes, you heard me right. She threw it away. So I quickly ran across the street and scooped it up. Her husband was into gardening. He had a greenhouse and many plants. After he died, she weeded through alot of his gardening things. Lucky for me, this was one of his flower pots she didn’t want. I always enjoyed visiting him. He was very proud of his plants~he would call me over to see a new blooming orchid or bulb that had emerged in his green house. I would usually end up going home with a cutting or plant that he wanted to share. I miss him and his passion for gardening. He was a good man. 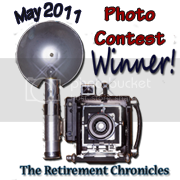 Visit Coloradolady to see more vintage thingies. Ever heard of a Bird-scarer, a Moggy, a Bogeyman, a Shuft, maybe a Rook-scarer or a Kelson, Hodmedod or a Tattie bogle? How about Priapus? Let me enlighten you, Priapus was the son of Aphrodite in Greek mythology. Priapus was a protector of gardens and orchards, and is typically portrayed as a hideous looking man. Birds tended to avoid fields where Priapus resided, so Greek and then Roman farmers soon adopted the practice of carving wooden statues that resembled Priapus in thier gardens to keep crows from eating the corn. In the Middle Ages children worked as crow-scarers. They would run around in the fields, clapping blocks of wood together, to scare birds that might eat the grain. Later as the plague claimed many lives, farmers found there were less children to shoo birds away so they stuffed old clothes with straw, put a gourd or turnip on as their head and mounted the figure in the fields. These lifelike figures kept the crows at bay. Also before the white man arrived, Native American men would sit on raised platforms and shout at birds or ground animals that came near the crops. The use of scarecrows also came to North America with immigrants from Europe. German settlers in Pennsylvania called them bogeyman, which stood guard over the fields. So now you know a quick history of where scarecrows came from. We tend to only use them as decorations that represent fall harvests these days. Who amongst us doesn’t enjoy seeing a scarecrow overlooking a lush vegetable garden. I know I do. My Vintage Thingie is something I bought at a flea market probably 20 years ago. At the time, I fell in love with it because it was so unique and different from anything I had ever seen as far as pottery. I paid somewhere around $25 dollars for it and that was a splurge for something so unusual and weird, but I had to have it. Except for some chipping glaze, it was in great condition then but now it shows the ravages of time (or in other words the ravages of hanging around me~ I dropped a ceramic snowman on it one Christmas time and cracked the base.) I felt so bad. It adds character or so I tell myself. It stands about a foot tall and is about a foot wide. The bird is some sort of water fowl. One of my friends once told me what kind of bird it was but I can’t remember the name. I can’t find anything like it in the bird field guides, so if anyone knows I would love the info. This piece is signed, W. Sewell with the word Zena underneath the name. There is a carving of a womans face and a glaze insignia of what looks like a tree on the bottom of it. I have no idea when it was made or where it was made. I only know I think it is very cool! So there is my Thingie for this Thursday. 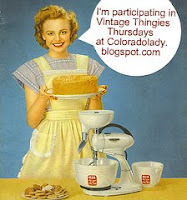 Visit Colorado Lady to see other interesting Vintage Thingies. Since it is dreary and gray outside today, I decided to look through my photos to see what I might have for Micro Monday. Turns out I have plenty. So I thought I would share a few of them which evoke memories of hot sunny cheerful days. I already miss them and summer is so very far away. Autumn has it’s virtues of course but I will always choose warm weather over any other kind of weather there is. Have a great Monday! Visit Lisa’s Chaos to see other Macro Monday Entries. Happy Friday! Since I have put my gardens to bed for winter, I haven’t much to flaunt but I went out there anyway, hopeful, camera in hand. To my surprise I actually found a couple of blooms in the garden. Meager as they are, they are still flowers, so here they are. All two of them. This aster squeaked out a couple more flowers. I guess you can’t keep a good aster down. And my front porch geraniums are still hanging in there. I also found my beautiful Japanese maple practically glowing in the front yard. This is the first day it’s color really jumped out at me. The holly caught my eye also with those pretty bright red berries. Since that is hardly enough to talk about, I decided to check out the indoor plants and see if I had any excitement going on there. My African violets had some pink flowers. Yay! Alas, a bud on my Christmas Cactus. That would make it a Halloween cactus, I guess, but I’m not fussy, I will take a flower blooming in any shape or form. Thanks for visiting! Stop over at Tootsie’s blog to see what other gardeners have growing. There is still a bit of growing going on here. 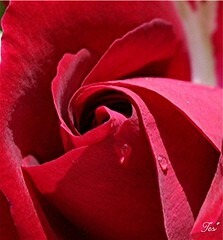 The rose bush surprised me with a couple of new buds, even though I thought I had seen the last flower last week. and the little pink flowers must like the cool temperatures. My geraniums are still flowering as well. And the morning glories seem to go on endlessly in the cooler temperatures. Visit tootsietime to see the flaunting of flowers in other gardens.